WHITE PLAINS, N.Y. — Dos Equis, the Official Beer Sponsor of the College Football Playoff is keeping things interesante this season with partnerships with the Florida Gators and the Crimson Tide Sports Network. Both are robust three-year sponsorships with a variety of on-site and media tie-ins and an emphasis on responsible consumption. The partnerships are the latest in Dos Equis’ “Keep It Interesante” campaign, launched this past spring to give drinkers permission to embellish their stories to make for a more entertaining night out. “We thought we’d give these modestly known football programs a break by allowing them to partner with a college football juggernaut like ourselves,” says Quinn Kilbury, senior brand director at Dos Equis. This is the brand’s third year supporting college football. 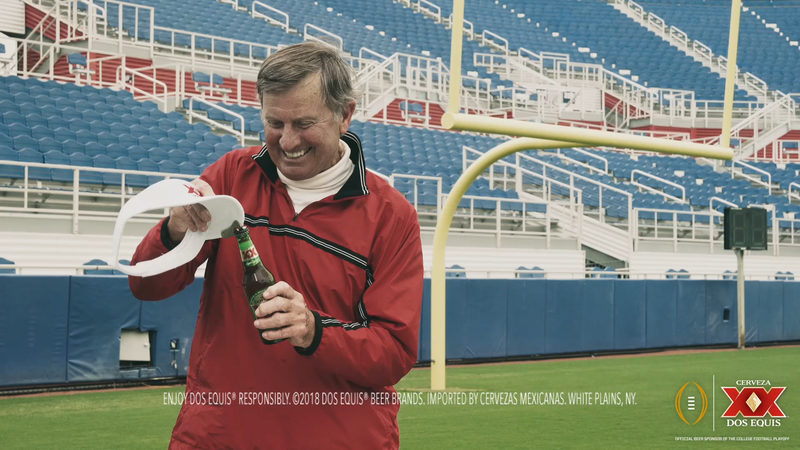 Earlier in the season Dos announced that it had hired former University of Florida football coach Steve Spurrier as head beer coach and former Louisiana State University coach Les Miles as chief lawn officer. Dos Equis is also running a season-long promotion in bars across the country that gives consumers 16 chances — one per week — to win tickets to the College Football Playoff National Championship by snapping a picture of a Dos Equis bottle or can and texting the keyword XXFAN to 77000. HEINEKEN USA Inc., the nation’s leading high end beer importer, is a subsidiary of HEINEKEN International NV, the world’s most international brewer. Key brands imported into the U.S. are Heineken®, the world’s most international beer brand, the Dos Equis Franchise, the Tecate Franchise, and Strongbow Hard Apple Ciders. HEINEKEN USA also imports Amstel Light, Indio, Carta Blanca, and Bohemia brands. For the latest information on our company and brands, follow us on Twitter @HeinekenUSACorp, or visit HEINEKENUSA.com.